Digital rendering of Creighton University's Phoenix campus expected to be finished in spring of 2021. According to a release, a 200,000 square foot building, which will eventually housed 800 Creighton students in Arizona, is phase one of the project. 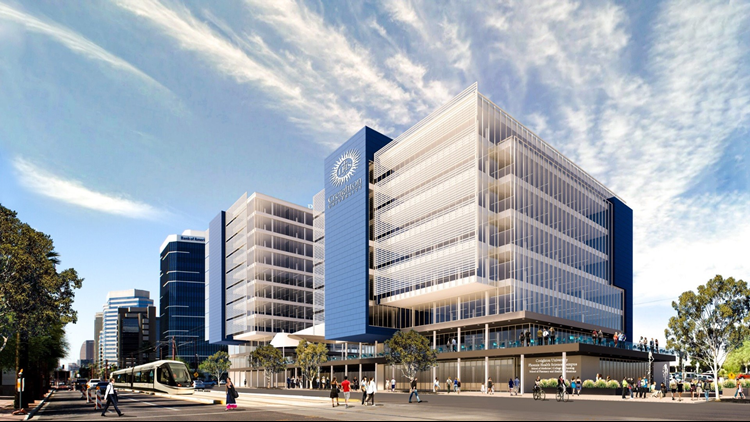 Park Central in midtown Phoenix is about to be home to a brand-new medical school. Creighton University, which is located in Omaha, Nebraska, reached an agreement to build a roughly $100 million health science campus along Central Avenue. A release called the announcement a "significant expansion" of Creighton's presence in Arizona. Creighton University's School of Medicine first came to Phoenix in 2009. According to a release, a 200,000 square foot building, which will eventually housed 800 Creighton students in Arizona, is phase one of the project. That building will be built on a parking lot on the Park Central property. A second building might be added in the future. The new campus will include a four-year medical school, nursing school, occupational and physical therapy schools, pharmacy school, physician assistant school and emergency medical services program. “Creighton University has strong connections to the Arizona medical community, and we look forward to expanding our impact," Rev. Daniel S. Hendrickson, president of Creighton University, said in a release. During construction, Creighton University’s College of Nursing which launched an accelerated program in Phoenix back in January will be moved to a temporary home at Park Central. The university's medical school will continue operating programs near the Dignity Heath St. Joseph’s Hospital and Medical Center. Construction on the new building is expected to begin in spring of 2019 and end in spring 2021.